Ray Moore called us with the story that his daughter Holly had died and that the coroner did come to the conclusion that is was suicide. The family of Holly did not believe that. We get this type of request on a regular bases and often our conclusion is that suicide is more likely than homicide. In this case the Castle Rock police force and coroner concluded that this was a suicide. 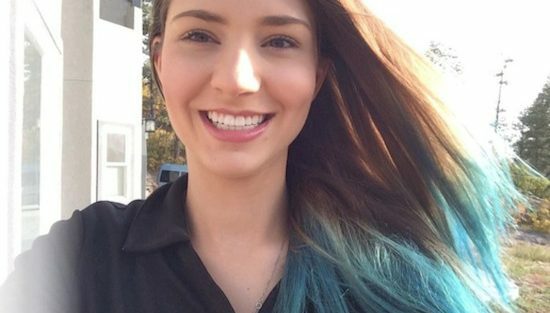 If you hear the story about Holly’s situation one should consider suicide as a possibility. But every suicide should be treated as a homicide, till proven otherwise. Tunnel vision will lead to important evidence getting lost. We met the family in Castle rock to perform an investigation on the crime scene. We warned the family that the outcome could be an conclusion which they did not want to hear. This was a rush job because the next day the landlord would wanted the apartment back empty. I never like to work under time pressure because you tempt to forget to sample certain evidence. When we looked over the crime scene some things were a bit off. We found fluorescent material in the bedroom. Not sure yet, but is could be urine. We see this often at crime scenes where victims are strangulated because of fear or due to death. After death muscle of the blather relax which causes urine to flow. From the pictures we had seen before we already knew that if this was a suicide Holly had acted weird. Her left hand was placed inside the strangulation cord as if she wanted to prevent getting suffocated. We have seen a lot of weird suicides, so one strange observation does not prove it is homicide. 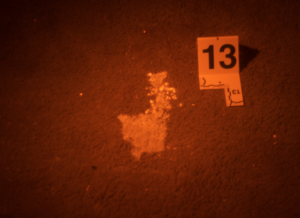 We took a lot of evidence from the house for (DNA) investigations, in order to perform a crime scene reconstruction. 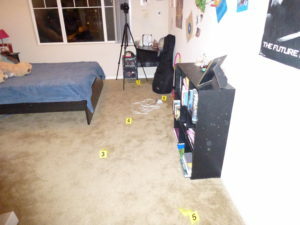 A couple of days after the scene investigation, we were able to review the body of Holly Moore. We did this with Rich Tewes, who is an ex police officer and forensic expert. When we opened the body bag all three of us were looking at the strangulation mark around the neck of Holly. It was horizontal. In hangings there is always a vertical element in injury because the rope goes up from the neck towards the object it is tied to, unless somebody was dead before they were hanged. This is a strong contra indication for suicide. Later we found out that her color bone was broken as well. If you hang your self it is weird to put your hand in the noose, is is extremely difficult to hang your self with a broken collar bone. Selma once broke her collar bone, moving your arm above your head and tie it to a rod seems impossible. After the investigation we advised the family to request the Castle Rock police to give the evidence and the case to the Colorado bureau of investigation. We can perform DNA investigations but we do not investigate suspects and we have no power to bring a case to court. This was more than a year ago now and nothing seems to have been investigated by CBI. Investigation Discovery broadcasted an episode of this case. The link you can watch here. Selma Eikelenboom-Schieveld had an interview with Crime watch. Sad case, especially in light that the investigators didn’t request the scientific evidence uncovered in your reports. It makes someone wonder why and whom the former investigators and pathologist were trying to protect from a murder investigation.